Jeff and Stephen Kay of Howth Yacht Club took part in one of the big racing events in the UK recently. In Birkenhead there were 21 boats altogether and Jeff managed a podium in 3rd place with Stephen ending up with a very respectable 10th place. Pretty good results as putting them in perspective in that fleet was the former World champion Rob Walsh and other top ranking skippers at European and World Championships. So a pretty tough bunch of skippers to sail with. Stephen then went on to compete at the 2016 Malta Open and recently returned from it. It was his first serious event with his new Britpop design (he sailed his V9 design at Birkenhead) and while he found his pace to be on part with the top skippers the lack of experience in starts with a full fleet of boats costed him a lot of points. Being a small fleet of us here sailing regularly mean that we know each other well and so can becomes 70% match race vs fleet race as we know who is good in what conditions and we have much more room at the start too. I experienced this also few months ago competing in France. If you allow yourself to get swallowed by the pack on the line you’ll get spit out at the back very quickly. Experience is key there and I can be safe in saying like with any other boat classes, full size or RC the race starts 5 minutes before the actual start. You need to be quick to react to situation and find plan B or C very quickly too. Talking to Stephen, the wind was tricky with lots of shifts and puffs and lulls resulting in numerous changes of places throughout each races. This made rounding that first mark ahead so crucial as once the pack arrived that weather mark could become very crowded very quickly and that’s a risk to loose big. An elevated piloting area made it easier for the skippers to see their boats. There were a number of nationalities at this event which was won by a German followed by 8 UK skippers with the first skipper from Malta finishing 10th. Stephen finished an honorable 23rd out of 42 boats. This shows the dominance of the UK Skippers in Europe making them one of the toughest fleet. As I said earlier about Birkendhead… to put things in perceptive! What is also worth mentioning is that if you look at the results it is no long a clear dominance from the Britpop design anymore as there is a clear spread of designs in across the results. Which means that other designers have catch up to Brad’s BP design and leveled the playing field once again providing close racing as we want. Download results below. Gilbert will be travelling to France and will race at a regatta on the 10th April but with a restored boat so it will be interesting to see the outcome. #modelboat – Pirate ships were made of wood, viking ships were also build of wood, in fact a lot of boats were made using this noble and natural material, wood writes Gilbert Louis. But nowadays most of the boats are build using composite materials like fibreglass, carbon, kevlar, aramid, honeycomb etc...I said most because some are still built in wood. I used to race a Europe dinghy made entirely in mahogany over 25 years ago when I was racing in this class in France and yet I was as competitive as with a fibreglass one. Some model boat classes like the IOM (International One Metre) forbid the use of exotic composites like carbon, kevlar and other expensive type in the building of the boat to keep the cost down. However the class rule do allow fibreglass for the hull and carbon fibre for the fin and rudder but to encourage home build, they allow wood too. One could think that a wooden boat wouldn't be a performant as a fibreglass one. But they'd be wrong. A German skipper designs and builds his boat (in wood as well as fibreglass), and even builds his spares in wood and uses florist wrapping laminate to cut his sails in and regularly finish in the top ten at international events. This shows that it is not all about the latest design or building material. There is something magical in a wooden boats, something a fibreglass boat simply can't deliver. I remember my fireball had a a kevlar reinforced hull but a wooden deck and I loved it, it looked fantastic. 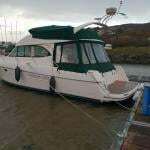 In IOM I've only sailed fibreglass boats but this is about to change as I am about to take delivery of my first woody or wooden boat. I am expecting a lot from that boat, and actually think that being in wood will add to the performance as it will be a really stiff boat yet with corrector weights to bring her up to minimum weight (amount of corrector weight still to be determined but expect to put around 100g). Thanks to Neill's great wood working skills who did a fantastic work building his XP. 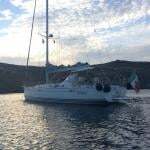 I will be campaigning this boat going forward – I'm going to build new rigs, get new set of sails will spend time on the water to learn how to get the best of her. Hopefully joining 2 other skippers to see what we can do at the Woody's championships in the UK (reserved to wooden IOM). But also will race against fibreglass boats. It is the beginning of a new chapter for me and if you want to know more about how I get on with my woody then stay tune as I will write progress and findings here. #modelboatracing – Further to the IOM model yacht class development in Northern Ireland thanks to Brian O'Neill who joined the fleet about 3 years ago and who has rallied other people from the North to our activity, a new club has emerged over the winter of 2013 in Belfast Waterworks writes Gilbert Louis. This location is not new to model boats as the activity started in 1933 and lasted until the mid 1960's when a fire burned down the club house. But now model boats are back sailing on this man made pond. It is entirely purpose build for Belfast County needs in concrete. It is flat bottom and with a depth of around 1.2m it is plenty for our model boats. This was made possible by the support of the Belfast Council who welcomed the request, happy to see activity on this pond once more – A big thank you to the Council for their support ! I hope this will be the first of more inland ponds open to our activity to come. For now most of our sailing is on the sea but we are tight to the tides whereas on a pond we could schedule sailing well in advance. Fair play to Bill, Wayne and Brian for making this a reality and adding to our sailing venues. For now they are sailing RG65 and in particular Drafon Force 65, IOM and occasionally A class too. #MaritimeFeatival - Irelands largest Model-Boat Exhibition will be held during the 2nd John Barry Maritime Festival in Wexford. The Model Boat Exhibition takes place on the weekend of 22-23 June (11am-5pm) as part of the four-day festival which starts tomorrow and ends on Sunday. Exhibiting an extensive range of model displays will be from the Rosslare Maritime Museum, the Boat Builders Project, the Marine Institute's Touch Tank, Irish Navy aswell as maritime stalls selling their wares. As previously reported on Afloat.ie the John Barry and JFK Photographic Exhibition is to held in the Talbot Hotel as part of the festival's new Maritime & Heritage Cultural Walking Trail. This year's Heritage Week (20-28 August) includes a one-day maritime lecture's seminar organised by the Maritime Institute of Ireland. The lectures will take place in Dún Laoghaire Club, Eblana Avenue, Dún Laoghaire (12.30 to 6pm) on Sunday 28th August. In addition to the lectures there will be an exhibition of Model Boats, by Garry Mooney, secretary of the Irish Model Boat Club, throughout the day. Below is listing of the lecture programme and times. 12.30 – 1.30 pm. Neutral Ireland's Role in the Sinking of the Bismark, May, 1941. By Dr. Michael Kennedy, Executive Editor, Documents on Irish Foreign Policy, Royal Irish Academy. 1.30 – 2.30 pm. Traditional Boats of Ireland. - Wooden workboats from all the Maritime Counties of Ireland. By Darina Tully, Lecturer and Maritime Archaeologist. 2.30 – 3.30 pm. Too Many Bags in the Lifeboat. A Lifeboat Tragedy at Bray 1876. By James Scannell, Lecturer and P.R.O of the Old Dublin Society. 3.30 – 4.00pm. Model Boats, A short talk to accompany the exhibition. By Garry Mooney secretary of the Irish Model Boat Club. 4.00 – 5.00 pm. Maritime Guinness, The Ships, Yachts and Barges of the Guinness Dynasty. By Dr. Edward Bourke, Diver, Maritime Historian and Author of "Guinness, the Family, the Business and the Black Stuff"
5.00 – 6.00 pm. Ireland's Armada Heritage. The Story of the Spanish Armada of 1588.The discoveries of the wrecks on the Irish Coast and the recovery of artifacts. By Cormac Lowth, Lecturer, Author and Diver.